Students will delight in Petronius' highly entertaining stories, including his famous "dinner party," which provide a colorful view of life in first century CE Rome. Some 901 lines of unadapted Latin with facing- and same-page syntax and vocabulary notes make this text an excellent transition to authentic, connected Latin for advanced high school and intermediate college students. Lawall’s Petronius is a rara avis indeed. His edition is one of the few, real Latin texts that a relative beginner to Latin can both manage and enjoy. As early as the second quarter of Latin I have introduced the class to Petronius. Inevitably the reaction has been enthusiastic. Would that there were similar editions of other Latin authors! With Petronius the teacher has no difficulty convincing students that studying Latin is worthwhile. The last two decades have seen a revival of interest in the Satyricon: Fellini’s film, the Millionaire’s Dinner Party, M. S. Smith’s Oxford edition of the Cena and a complete Penguin translation. Nonetheless, this American edition could well fill a gap, offering as it does a selection of episodes (only 37 chapters of the original, rather fewer than the size of the book suggests) together with vocabularies and brief notes. Produced originally for (and in part by) students at the University of Massachusetts, it could find an English context in post-O-level reading of Latin literature.... but a class equipped with this book will find Petronius instructive and entertaining. Certainly the use of a reader such as this will not only enliven an introductory course but will also provide substantial connected reading and exposure to many aspects of Roman culture…. Material for this book was assembled by students participating in a seminar on Petronius conducted at the University of Massachusetts at Amherst in the fall of 1974. The text of Petronius is basically that of Konrad Muller (Munich, 1961) with some changes on the basis of Martin S. Smith’s 1975 Oxford University Press edition. Running vocabularies face each page of the text. When a word occurs a second time it is marked with an asterisk, a third time with two asterisks, and a fourth time with three asterisks. Then it is dropped from the vocabulary lists. A word marked with three asterisks may be found at the end of the book in a vocabulary. Certain basic words with which the reader should be familiar before beginning the text are not included in the running vocabulary and are given in the instructions for using the book (pp. 6-9). 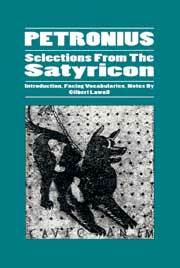 The general introduction provides a brief summary of the story line of the Satyricon. The five reading selections of unequal length are titled as follows: A Scene at the Market Place; Dinner at Trimalchio’s;. The Matron of Ephesus; The Death of Lichas; Eating Human Flesh for Money. The notes at the bottom of each page are helpful and copious. The running vocabulary allows the student to proceed rapidly through the text. The passages selected seem interesting and appealing. Expressions regarded traditionally as obscene or scatological are not omitted but are treated gingerly in the notes and vocabulary. For example on pp. 70-71 the expression frigori laecasin dico is translated in the notes as ‘I say to hell with the cold.’ In the running vocabulary laecasin is explained as ‘an obscene word either from the Greek laikazein (=Latin fornicari) or leichazein (=Latin fellare).’ This attractive edition, while obviously prepared for college students, would be useful for mature high school students. The format lends itself well to independent reading and study. The book is beautifully printed.